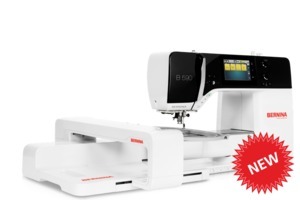 The B 590 is the top-of-the-line 5 Series model that boasts full embroidery functionality with sewing and embroidery speeds of up to 1,000 stitches per minute (SPM). 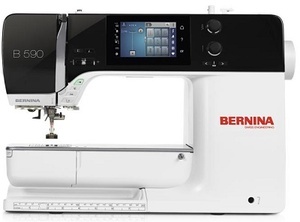 Additionally it offers a 9.0 mm stitch width, 8.5" freearm space right of the needle, 8 embroidery alphabets, 275 built-in embroidery designs, 500 stitch patterns, and comes standard with the BERNINA Stitch Regulator (BSR). Other embroidery features available include: Pinpoint Placement, Undo/Redo, Group/Ungroup, a new Color Wheel and access to a Creative Embroidery Consultant. 1. 8.5 free-arm length to right of the needle. 3. BERNINA "B9" hook system. 5. BERNINA Adaptive Thread tension.